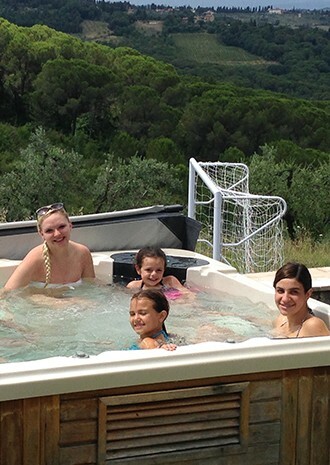 ... and the family frolics in a hot tub at the villa. Tracie Haas admittedly leads a hectic life, with a full-time job and three young children. Travel is important to her family, though, and she did luck out in one regard: her roommate from when she lived in NYC in her 20s, Danielle Meeker, ended up entering the travel industry and becoming a Virtuoso advisor. Despite her friendship with Danielle, Tracie was still initially skeptical of using a travel advisor – in large part because the Internet has made it so much easier to research potential hotels, destination experiences, and more. "I quickly found that it doesn't take much to work with a travel advisor, though," admits Haas. The advisor has planned several trips for the family, including a 10-person journey to Italy (predominantly Tuscany and Rome) with children of various ages involved. "On that trip, every detail was covered. 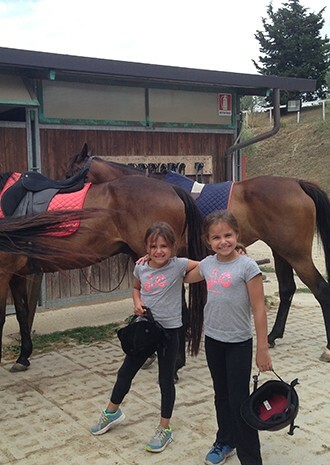 The tour guides were excellent, and there were always things for the different kids traveling with us to do," says Haas. She cites one specific example: when the group landed (in Rome), their first location of the trip was a villa 30-40 minutes away. Haas herself travels a lot for work, but some of her companions on this trip travel a lot less. The advisor outlined three options from Rome's airport to the villa: a car rental, a train, and a private car pickup. Each option had pros and cons listed, timing of itinerary, and price points. "Knowing the options and the prices and being able to pass all that along, already put together, to everyone else on the trip was invaluable," says Haas. "The decision-making on what to do is basically already there for us." Haas has known her advisor for years, but the same tenets of their relationship ring true decades later. "She's always one step ahead with everything in terms of planning," notes Haas. "The level of support is extraordinary when you work with Virtuoso advisors. Life is hectic and busy and it can be hard to put the pieces together, especially for the experiences you really want to be great, such as traveling. What the advisor does is amazing in that regard."